When it comes to reciprocating saw the Milwaukee Sawzall (left) has everything you need in a durable, affordable package. The kit reviewed here (right) includes the fitted case. Every once in a great while a manufacturer designs and builds a tool that becomes the namesake for an entire category. So is the Milwaukee SAWZALL®. This tool became so universally liked that everyone from contractors to industrial workers and handy persons began calling any reciprocating saw a “Sawzall”. 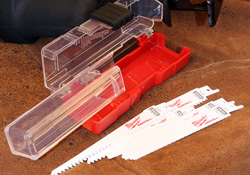 Same general shape and function perhaps but there was but one Milwaukee SAWZALL®. That was then. Now there is the Milwaukee Super SAWZALL® and this old workhorse is breaking new ground in capability, usability and durability. The also-ran copycats are now further behind than ever. The 15 amp motor (left) seems to have more power than other 15 amp motors but I have come to expect that from Milwaukee. To control that power they include a variable speed trigger and speed control (right) so you can select the right combination for your job. There is nothing pretty about the environment for which the Milwaukee Super SAWZALL® was designed. Though not unattractive, the exterior of this tool is decidedly heavy duty and fashioned from materials that can withstand the knocks and scrapes that will undoubtedly happen on the job site. The grip has rubber panels that both cushion the hand and afford a better grip for even gloved hands. The variable-speed, trigger-style On/OFF switch makes controlling the blade throughout even complex cuts simple. 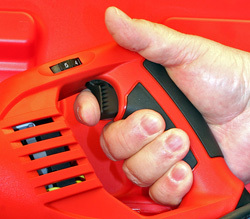 Just above the thumb is a speed control dial that lets the operator select the best speed range for the job. The 15-amp, 120V motor supplies plenty of power to drive the 1-1/4” stroke. A patented counter balance system keeps the Milwaukee Super SAWZALL® remarkably vibration free despite the blade reciprocating at between 0-2,800 SPM (strokes per minute). The motor has the highest overload protection circuits in the business which lets you apply the needed power to the job. To further enhance the cutting action Milwaukee includes an orbital control on top of the forward section. Slide the orbiting button left or right to increase or decrease the amount of orbiting action of the blade. The motor features Constant Power Technology™ that helps it maintain an rpm setting when under the irregular loads of cutting. The motor and the entire operating mechanism are shielded from damage by a patented Gear Protecting Clutch that intercepts the impacts of the blade locking in a cut or striking something. This one feature will prove valuable in virtually any work setting. Despite the list of features the Milwaukee Super SAWZALL® is still just 18-3/4-in-long and weighs in at a trim 9.8-lbs! The #6538-21 Milwaukee Super SAWZALL® kit shown in this review includes the Super SAWZALL® itself, instruction manual and a tough plastic carry case to protect it between job sites. No, no blades are supplied because they don’t know what you need. You can buy the exact type of blade you need at virtually any building, hardware or home center. Adjusting the sho3 position (left) is tool free thanks to the lever lock that makes this a very quick chore. Blade changing (right) is also tool free which is an even bigger help wherever you are using this tool! 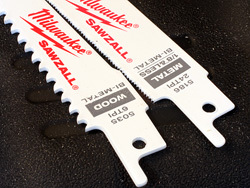 The one sore spot on previous Milwaukee SAWZALL®’s and their copycats was losing the hex wrench that was needed to adjust the shoe or change the blades. The nature of the work sites these saws were commonly used virtually guaranteed that eventually the hex wrench would slip into tool oblivion. To cure that frustration Milwaukee intentionally lost that hex wrench – for good. Milwaukee developed a lever-style lock for the shoe that lets you adjust its position very quickly without finding the hex wrench. 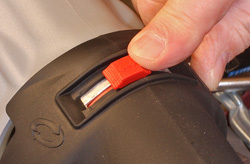 Being able to reposition the shoe also lets you increase access clearance to make changing blades easier. To eliminate the hex wrench entirely Milwaukee came up with their Quik-Lok™ Blade Clamp System. This is essentially a twist collar at the blade that lets you remove the old blade and install a new one with a twist of the collar. It is not actually an instant blade change but it is getting close. 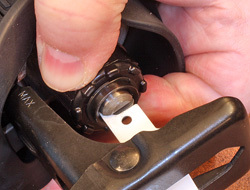 This finger-operated chuck also allows you to install the blade upside down when that is more appropriate for the job. Even though the Milwaukee Super SAWZALL® is one of the toughest power tools on the planet and brings a full load of features it remains surprisingly compact and light feeling to the hand. The layout of the grips is nicely designed and comfortable in use. 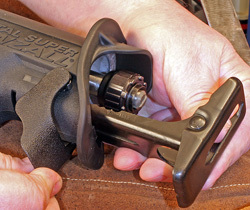 The grip areas also make this saw easy to operate with minimal experience. The forward grip area (left) is nicely shaped to be comfortable yet easy to control the saw. The oscillation feature (right) comes in handy, especially when cutting wood. You can adjust how much oscillation there is by where you slide the button! The huge range of blades available for the Milwaukee Super SAWZALL® let you make use of the power in a surprisingly large range of tasks. There really is very little in the way of cutting chores that the Milwaukee Super SAWZALL® can’t handle if you give the problem a little thought. While getting ready to thrash the Milwaukee Super SAWZALL® I discovered that I was out of Milwaukee blades. Full disclosure: I actually had a few “other” blades that I bought when I couldn’t find Milwaukee’s in some little store but I don’t like those and I am not an idiot, regardless of what you may have heard. Milwaukee makes great blades and I am not going to judge the Milwaukee Super SAWZALL® performance on a suspect blade. I found a Milwaukee set (#49-22-1145) of 9 assorted blades that come in a very trick case at a very good price - $19.97. (2-11-2012) The case can even be adjusted to store 9” of 6” blades. The set comes with metal and wood blades, which cover my needs for this review and well beyond. I have always liked Milwaukee blades because they seem to cut better and last longer than the only slightly less expensive brands some big box stores try to force on you. Something that always intrigued me about the Milwaukee blades is why they take the time to give them a paint job better than on some cars I have bought! Whatever, they work great and that is what I am looking for. 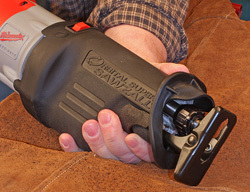 I use the Milwaukee Super SAWZALL® in my home-based woodworking/metalworking shop more than I would have imagined. For the contractor, life without the Milwaukee Super SAWZALL® is tough to even think about. For the average homeowner/handyman the Milwaukee Super SAWZALL® can actually save a bunch of money because of its versatility. In many cases you can literally go buy a different blade rather than a different tool and that can save money in a big way. I found this group of Milwaukee blades (left) that came with the very handy carry case. Naturally, the Sawzall uses the blade style that Milwaukee made popular and that you can find just about anywhere! The control of the variable speed trigger and dial-operated speed control make the Milwaukee Super SAWZALL® both an exceptionally powerful and easy to use tool. The orbital feature is something you need to explore because its impact on cutting can be dramatic. You don’t need it all of the time but it is great to have for many cuts. Being able to adjust the amount of orbit is better yet. You do not need a bunch of experience to use the Milwaukee Super SAWZALL® effectively. Basic safety practices like keeping body parts away from the blade and looking where whatever you care cutting is going to fall are required but after that it is all common sense and the right blade. The Milwaukee Super SAWZALL® does more of the work for you than many similar looking tools. Probably more important is that the true-running blade and the amount of control you have over the speed means that this tool doesn’t work against you. I have used other reciprocating saws and then picked up a Milwaukee and many of the others simply can’t make that claim. The durability of Milwaukee Tools (Nothing But Heavy-Duty) is legendary and the Milwaukee Super SAWZALL® just might exceed even those lofty expectations. 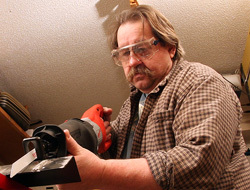 I have had a few SAWZALL®’s over the years that were used heavily and to be honest, abused just as much. I have yet to have one stop working without being run over by heavy vehicles, sometimes more than once. I suppose lightning might kill a SAWZALL® but that has not become a problem at my job sites – so far. 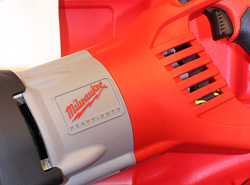 Use reasonable care and I cannot imagine a Milwaukee Super SAWZALL® letting you down. 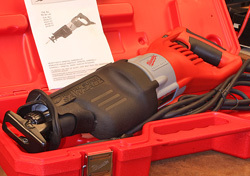 The #6538-21 Milwaukee Super SAWZALL® kit shown in this review has a street price of about $199.00 (2-9-2012) which to me is remarkable for this kind of tool. It is getting tougher every year to find this kind of quality with such a usable group of features at any price. If you need a reciprocating saw you can save a bunch of money and frustration by getting the original Milwaukee Super SAWZALL® the first time. When I needed a tough, long-lasting tool I have depended on Milwaukee Tools for decades. They have never let me down and by the looks of the Milwaukee Super SAWZALL® that level of design and manufacturing remains part of their tradition. Visit the Milwaukee Tools web site – Click Here!